It’s no surprise that I love chocolate. I work for a chocolate company. Eat my fair share chocolate on a regular basis. And, oh yeah, my blog title is all about chocolate. And wine. Which is the perfect lead in for this post. 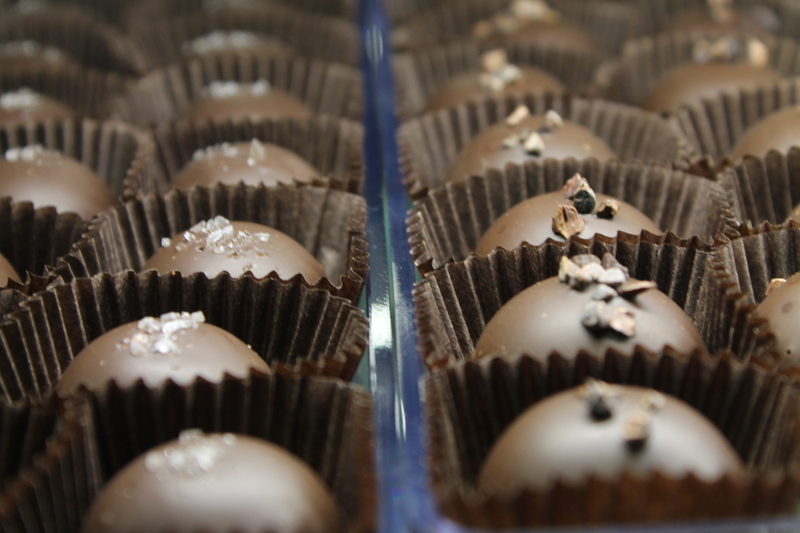 Chocolate Therapy: Sweet Remedies, located in Framingham and Dedham, Massachusetts, offers a workshop that pairs their handcrafted chocolate delicacies with different types of wine. Owned by husband and wife duo, David and Pam, the workshop was unique from other pairings I’ve taken part in, if not only for the innovative creations they are becoming known for. The obvious passion and love for their craft also shines through in their welcoming, chocolate-filled shop. They were as sweet as the chocolates they make! 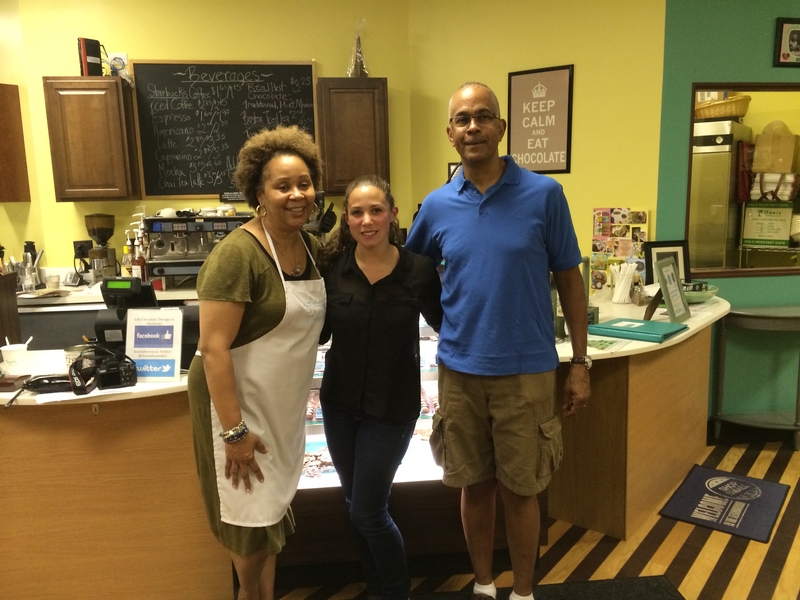 At Chocolate Therapy: Sweet Remedies, their mission statement is all about using chocolate as a healthy way to indulge your soul. And that’s what we got out of the workshop – a little bit of education, and a whole lot of indulgence. All good things in this photo. First, Pam went through the differences of the different types of chocolate that were on our plates, explaining what makes white chocolate distinctly different from milk and dark chocolate. She also explained how their chocolate creations are made with Belgian chocolate, which was a fun departure from the Swiss chocolate I know very well. I was also thoroughly impressed when I asked how long it takes for them to turn innovative ideas into actual physical creations you find in their storefront cases. Their answer? 2 days, sometimes less! That really blew me away. 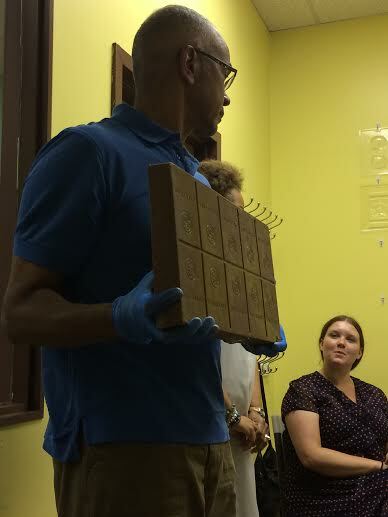 This brick of Belgian chocolate is approximately 25,000 calories…. Yum. After getting background about how and where cocoa beans are harvested and how she and David went into the chocolate-making business after spending years in the corporate world, we then dove headfirst into the pairing portion of the workshop. The first chocolate was called a “Pom Balm” – dark chocolate ganache, pomegranate molasses, dusted in purple cocoa butter luster. It was paired with a crisp and light Pinot Grigio from Italy. Now, I am not usually a pomegranate fan. I don’t enjoy the effort it takes to eat the seeds from one, nor do I enjoy Pom juice. But this chocolate? I wanted more. It was sweet and silky and the taste really popped in your mouth when eaten with a sip of the Pinot Grigio. The second pairing was a milk chocolate truffle and Californian Petit Syrah. This was the most familiar chocolate to me out of the group, except for the fact that it too was dusted in a cocoa luster, this time gold. 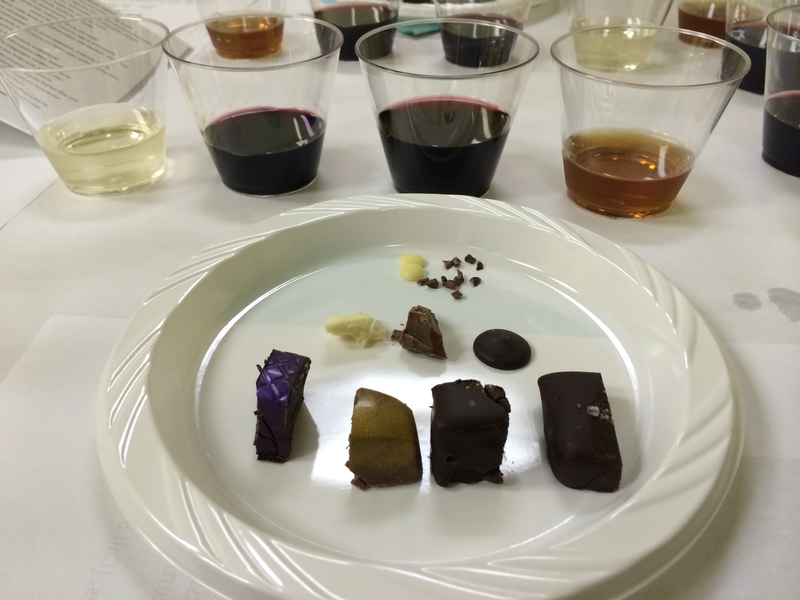 The milk chocolate melted in your mouth, especially when the Petit Syrah was sipped along with it. A very interesting and complex take on milk chocolate. The third was by far the most out-of-the-box for me. 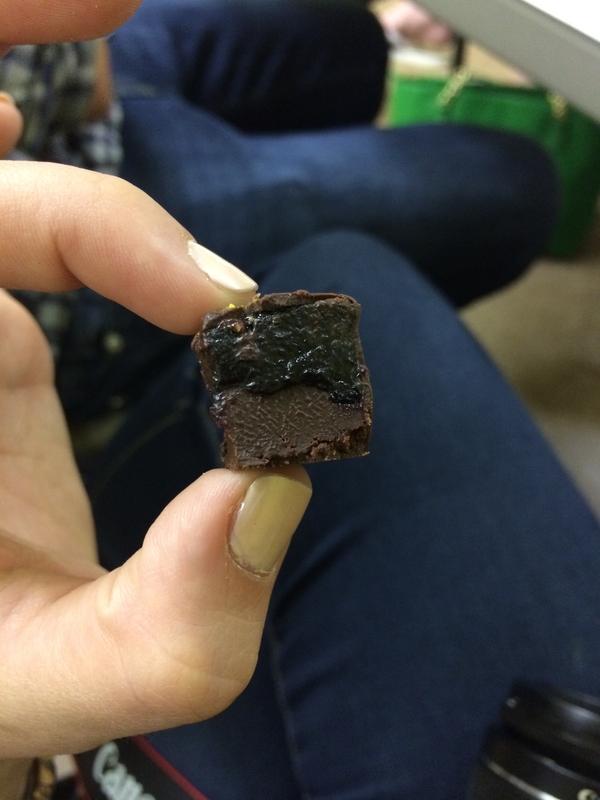 The chocolate itself, a Blueberry Lemon Basil truffle, was exotic and unexpected, with layer upon layer of flavor. I love blueberry and lemon together, but the basil really elevated the chocolate, and the whole thing was coated in dark chocolate ganache. It was paired with a Merlot from California, but I could’ve eaten a dozen of these truffles with no beverage whatsoever. If you love trying new things, this is the truffle for you. Finally, salty and sweet come together harmoniously in the Sea Salt Caramel truffle that was set to be paired with a dry sherry from Spain. The buttery caramel, made with Tahitian vanilla, was dipped in dark chocolate and finished with a sprinkling of pink Himalayan sea salt. It really mellowed out the sherry, which I usually find to have a harsh flavor. The two married well together to result in a wonderful finale to the pairings. After the tastings, the couple unveiled a fun secret: They had created a life-size chocolate goat for an upcoming event that was still in the back room of the shop. 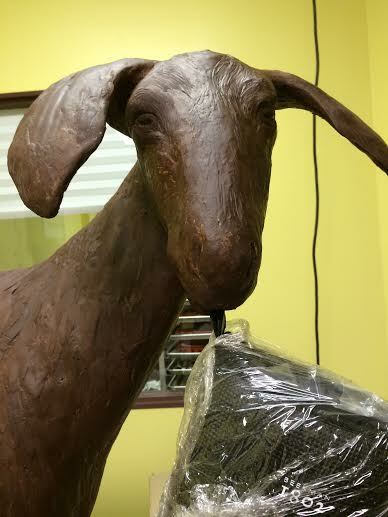 Yes, you read that right – a life-size GOAT made of chocolate. It was fantastic and incredibly realistic looking. Truly a chocolate masterpiece. It was holding a real boot in its mouth. Hilarious. Overall, my time at Chocolate Therapy was educational, indulgent and well spent. I even bought a goodie bag to take home (which was gone the next day after dinner.) I would highly recommend Chocolate Therapy for a date night, girl’s night out or an after-hours work excursion. 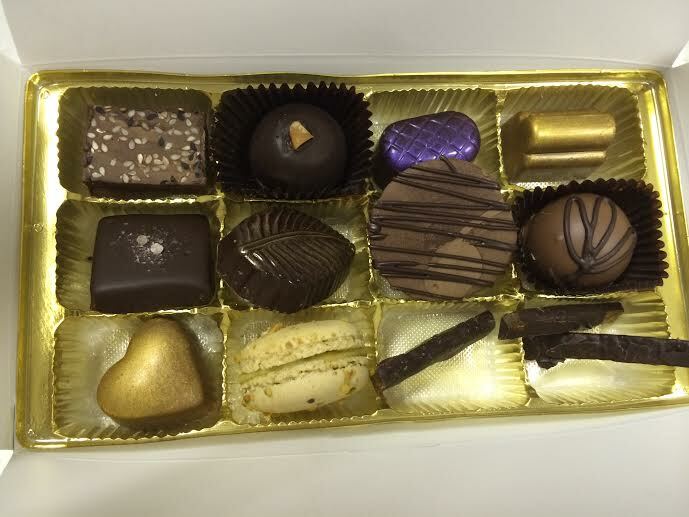 Everything from homemade peanut butter cups to a milk chocolate truffle with champagne inclusions! Disclaimer: I received a complimentary Chocolate Therapy workshop at Sweet Remedies. All opinions are, as always, my own.